We’d love your help. Let us know what’s wrong with this preview of Billy Has A Birthday by James Minter. To ask other readers questions about Billy Has A Birthday, please sign up. I haven't read many middle-grade books in my adult life, but after reading Billy Has a Birthday, I might have to reconsider my choices in literature. I did not anticipate how much I would love this book. It was simple, straight to the point and just a jolly good read. It's Billy's tenth birthday, and he's having a party with a few friends. All goes well with the party, but Billy soon has a run-in with a friend's elder sibling, Eddy, and ends up having to hand over the birthday money his grandfath I haven't read many middle-grade books in my adult life, but after reading Billy Has a Birthday, I might have to reconsider my choices in literature. I did not anticipate how much I would love this book. It was simple, straight to the point and just a jolly good read. It's Billy's tenth birthday, and he's having a party with a few friends. All goes well with the party, but Billy soon has a run-in with a friend's elder sibling, Eddy, and ends up having to hand over the birthday money his grandfather slash magician The Great Magisco gave him. With the skills of The Great Magisco and his assistant, Max (the sister of Billy's best friend, Ant), Eddy gets a well deserved lesson in bullying and winds up in trouble with the law. This is a book for the whole family. There are some good lessons to be learned and the characters are a hoot. Although it took me about three chapters to be convinced, it was definitely worth the read. Along with the characters, I loved the dialogue. Some mention of the law may go over young readers heads, but it wasn't too overwhelming, and I think it will challenge young minds to enquire into matters unfamiliar to them. Overall, the subject matter is relatable and morally inspiring. The only problem I had with the book were the consistent grammatical and punctuation errors. They weren't a huge turn-off, but I did notice them as they kept cropping up throughout. I look forward to reading the other books in the series. Read more reviews on CBY. This chapter book is intended for children 8-11 and can be used in a family or classroom situation, or the children can read it by themselves. There are even additional activities available to help engage the children. A simple, everyday situation, a boy's 10t Bullying and abuse has never sit well with me, so any attempt to stop it is appreciated. James Minter has composed a series of stories about negative behaviour and positive outcomes, and Billy Has a Birthday deals with overcoming bullying. This chapter book is intended for children 8-11 and can be used in a family or classroom situation, or the children can read it by themselves. There are even additional activities available to help engage the children. A simple, everyday situation, a boy's 10th birthday, and an average family setting should make the children feel safe while reading, and, if guided well by the educator or parent, the child who reads it might open up about being bullied or witnessing bullying, which is what is usually the most difficult thing to do - open up and ask for help. Despite keeping the story simple and using likeable illustrations, the author does not embellish the boy's fear of the bully, the complications it causes and explains the real punishment which befalls the bully himself. As an early educator for many years, I became a huge advocate for quality children's books. My favorite ones are those that teach a life lesson in a subtle way. This book is a perfect example of how chapter books for this age group should be written. The author did a great job of incorporating true-to-form verbiage and props (references of YouTube, Internet, etc.) that target readers of this genre, for this generation, will relate to. Though, it saddens me a bit to see elements like this needing As an early educator for many years, I became a huge advocate for quality children's books. My favorite ones are those that teach a life lesson in a subtle way. This book is a perfect example of how chapter books for this age group should be written. The author did a great job of incorporating true-to-form verbiage and props (references of YouTube, Internet, etc.) that target readers of this genre, for this generation, will relate to. Though, it saddens me a bit to see elements like this needing to be incorporated into children's books, as I prefer the simplicity of the ones I grew up reading. But even many of those have been revamped to appeal to "today's kids". Billy’s Tenth Birthday is the first volume in James Minter’s new Life Learning Series. The story follows Billy, a young boy who turns ten on the tenth October – 10, 10, 10 – a once in a lifetime occasion. Billy’s excitement at his ‘big’ birthday perfectly encapsulates that of a child who is bordering on adolescence – each birthday seems so much more important than the last, and the move from single to double figures is one of the greatest of all. On Billy’s birthday he is over the moon to be giv Billy’s Tenth Birthday is the first volume in James Minter’s new Life Learning Series. The story follows Billy, a young boy who turns ten on the tenth October – 10, 10, 10 – a once in a lifetime occasion. Billy’s excitement at his ‘big’ birthday perfectly encapsulates that of a child who is bordering on adolescence – each birthday seems so much more important than the last, and the move from single to double figures is one of the greatest of all. On Billy’s birthday he is over the moon to be given a £20 note by his granddad. No more silly children’s toys, he can finally buy what he wants. At the age of ten this must seem like a huge amount of money – possibly more than Billy has ever owned. The options available to him seem countless. But things take an unpleasant turn when the local bully hears about Billy’s birthday present, and forces him to give it up – or else. Billy, like many other children his ages, agrees to the bully’s demands. Billy is devastated to have lost his special birthday present, but he attempts to keep the situation a secret from his mum and granddad. He has nothing to be ashamed of but has convinced himself that the adults in his life will be cross if they find out what has happened. Like many bullied children he feels he cannot turn to anyone for help. Fortunately, luck is on Billy’s side, and a little bird finds out about the Bully and tells Billy’s granddad. Together they are able to hatch a plan to get the note back and to ensure the bully gets what’s coming to him! 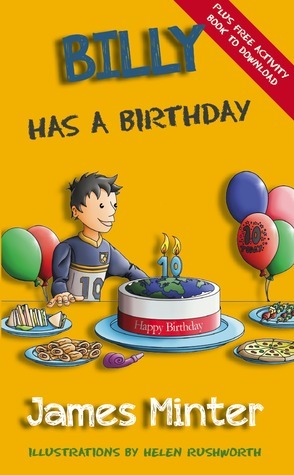 Billy’s Tenth Birthday is a wonderful example of a story that young children can enjoy reading together with their parents. The book carries Minter’s trademark wit, and is well written and accessible, but it also deals with a serious issue that will affect many children as they grow up. Bullying can be a difficult subject for children to talk about, many may feel frightened or embarrassed if they fall victim to bullying. Minter’s book acts as the perfect icebreaker for adults and children to begin discussing these issues. The message in Minter’s book is clear – you can’t rid the world of bullies but you can do something about how you deal with them. Billy's Tenth Birthday was a good, quick read to teach a child a moral lesson. The characters are realistic, often rambling as kids do, but the storyline is one that's helpful in teaching kids the proper way to handle a bully. The way Grandad and Max got Billy's 20 pound note back was clever and creative, which will entertain the kids reading or being read to. Some parts of the book I thought were a little beyond the maturity level of the targeted age of readers of the book. I'm not sure I would Billy's Tenth Birthday was a good, quick read to teach a child a moral lesson. The characters are realistic, often rambling as kids do, but the storyline is one that's helpful in teaching kids the proper way to handle a bully. The way Grandad and Max got Billy's 20 pound note back was clever and creative, which will entertain the kids reading or being read to. Some parts of the book I thought were a little beyond the maturity level of the targeted age of readers of the book. I'm not sure I would have referenced smoking at all, though the author snuck in the moral that smoking is bad in that way. I also might not have gone so much into detail about juvenile court and testifying against Eddy, only because I don't thinks kids will have any idea what that means. I also might have changed a few aspects of the grammar for the younger readers, such as not using conjunctions like "I've" and "there's". Writing the entire sentence out instead would open the book up to a wider reading audience. There were minor grammar and punctuation errors, but nothing too bad. As far as layout, I liked the double-spacing, but I might have made the font a bit bigger. The small font might be a little intimidating to younger readers. Very cute story. I am glad Billy had people that care about him and helped him with his bullying issues. Bullying is a big problem for children today but it is also part of learning to stand up for oneself. In this story Billy, like any other child, is looking forward to a big birthday … Disarming a bully is the better way of dealing with them. You can’t rid the world of bullies but you can do something about how you deal with them. Our story begins with a very excited Billie who discusses his up-coming birthday with his golden retriever, Jacko. Like most ten year old boys, Billie is really looking forward to turning ‘double-figures’. I can even remember when I turned ten – there really is no going back, is there? This is a delightful story that will appeal to many children but especially those who are aged 8 or 9 years. Billie faces some big issues that many children will relate to. However, using the kindness of his friends and his own intelligence he deals with the situations in a way that empowers and enriches his experience. This is where the most valuable lesson lies I believe. The story is very well written and is a joy to read. The illustrations are vibrant and colourful. They really add to the essence of the story. I highly recommend it. Nice to read a slightly longer story about bullying, and one that occurs outside of the school gates. There's a fair amount of back story to Billy, his party and presents to make him feel like a real person. The bullying itself is short but fairly realistic. Apart from the bully's language I'm afraid. Would a 14 year old boy really say: "when I want your opinion I'll ask for it... My beef is with birthday boy not you.... Pull the other one old man it's got bells on... Get off me you great oaf." N Nice to read a slightly longer story about bullying, and one that occurs outside of the school gates. Apart from the bully's language I'm afraid. Would a 14 year old boy really say: "when I want your opinion I'll ask for it... My beef is with birthday boy not you.... Pull the other one old man it's got bells on... Get off me you great oaf." Not sure what young readers will make of this bully's speech. it doesn't sound right when read aloud. The handling of the bullying is good - victim feels guilty, friends get involved, adults help, and eventually the bully is found out and punished. There are a few errors in grammar (missing commas, apostrophes in the wrong places) but overall its well structured and a reassuring short story about coping with bullying. A preface for adults puts it in context and there's a friendly afterword for children as well. This would be a good class read for KS2 PSHE lessons. Disclaimer: I received a free PDF copy of this book from the author in exchange for an honest review. Billy has a Birthday is the first of a series of Billy Books, and each takes a look at coming of age/growing up issues and moral dilemmas. In this first story, Billy falls victim to bullying from an older boy. It is a basic tale, easy to follow, and contains lovely illustrations at each chapter change. The series commits to Values-based Education and offers alternative ways to deal with various l Disclaimer: I received a free PDF copy of this book from the author in exchange for an honest review. Billy has a Birthday is the first of a series of Billy Books, and each takes a look at coming of age/growing up issues and moral dilemmas. In this first story, Billy falls victim to bullying from an older boy. It is a basic tale, easy to follow, and contains lovely illustrations at each chapter change. The series commits to Values-based Education and offers alternative ways to deal with various life issues. This book is suitable for shared reading between parent and child or just the child him/herself and is aimed at KS2. A few errors in grammar become apparent as you read (missing commas, full stops in the wrong places, etc.) but on the whole it is a well-structured book. While the characters do feel somewhat stereotyped, the tale still manages to get the point across, and it does so in a light and humorous way that both children and parents can relate to. I chose this rating since it was a story with a good lesson that bullies never win in the end. A boy on his 10th birthday surrounded by family, friends, his dog Jacko, and presents! What could be better? Nothing! So it’s a total bummer when the neighborhood bully, Eddie, takes Billy’s special gift of $20 that he just received from his grandad. This story is really about bullying and not so much about birthday parties or turning 10 years old. The story starts off light and fun with the birthday party and his grandad playing the part of a magician named The Great Magisco! Max, the sister of A boy on his 10th birthday surrounded by family, friends, his dog Jacko, and presents! What could be better? Nothing! So it’s a total bummer when the neighborhood bully, Eddie, takes Billy’s special gift of $20 that he just received from his grandad. This story is really about bullying and not so much about birthday parties or turning 10 years old. The story starts off light and fun with the birthday party and his grandad playing the part of a magician named The Great Magisco! Max, the sister of Billy’s best friend Ant, plays Magisco’s assistant. All the kids enjoy the magic show and afterward, Billy and Ant go for a bike ride. That’s when Eddie and his buddies make an appearance. Eddie uses the pretext of not having been invited to bully the money out of Billy. I really like that things get a little complicated here as that’s how real life often is. Billy is embarrassed and not sure if his mom and grandad will be angry with him. Luckily someone else knows about this and comes up with a plan to trick Eddie out of his ill-gotten gains. There was none of this ‘Stand tall and stand up to that bully!’ stuff that always sounds so good in fiction but can well end up with blood and broken bones in real life. The ending had a nice chat between Billy and his grandad and mom where the importance of involving those who can help is brought up. Billy goes on to have a great birthday while Eddie and his parents have a chat with authorities. After the tale is over, there’s a little bit about why the author chose to shape the story the way he did. I think this is a good conversation starter for parents who want to chat with their kids about bullying. The Narration: Lola-Rose Maxwell is very pleasant to listen to. Since this story is told in the 3rd person, it worked just fine having a female narrator for a male-lead story. She kept kids and adults distinct but not all character voices had their own flair. For instance, I was expecting grandad to sound old but he didn’t particularly. I also expected Max to sound more like a little girl kid but she sounded like a tween or teen. Maxwell did a great job of being part of the story, imbuing each character with emotion. Her pacing was spot on. There were no technical issues with the recording. Billy Has a Birthday is part of James Minter’s “Billy Growing Up” series for 7 – 9 year olds. In this installment, Billy is excited for his upcoming tenth birthday party. When an older boy named Eddy Jost gets angry about not being invited to Billy’s party, he confronts Billy while he’s out riding his new birthday bike and demands Billy hand over the birthday money he got from his granddad. How will Billy handle this? I found Billy Has a Birthday a little on the long side and I wondered if 7 – 9 Billy Has a Birthday is part of James Minter’s “Billy Growing Up” series for 7 – 9 year olds. In this installment, Billy is excited for his upcoming tenth birthday party. When an older boy named Eddy Jost gets angry about not being invited to Billy’s party, he confronts Billy while he’s out riding his new birthday bike and demands Billy hand over the birthday money he got from his granddad. How will Billy handle this? I found Billy Has a Birthday a little on the long side and I wondered if 7 – 9 year olds would lose interest before the end of the book. Additionally, I found the behavior of bully Eddy to be more than bullying, stealing money from much younger kids is on a more serious level than simple bullying in my opinion. I didn’t find the “go back home and bring me your money” scenario Eddy used on Billy to be believable. It seemed unlikely to me that a ten year old would feel compelled to follow the bully's orders. Also, the dialogue didn’t sound realistic to me either. I had a hard time believing a “bully” would talk like Eddy did. This book was loaned to me through the @kidlitexchange network. All opinions are my own. I loved this series of four books about the adventures of Billy and his best friend Ant. They are typical 10 year olds and enjoy having fun together. What I appreciated about the books was the lessons they taught to readers. Each of the books cover different struggles children might run into as they navigate life. The books provided strong adult support which only added to the stories. The setting in England This book was loaned to me through the @kidlitexchange network. All opinions are my own. I loved this series of four books about the adventures of Billy and his best friend Ant. They are typical 10 year olds and enjoy having fun together. What I appreciated about the books was the lessons they taught to readers. Each of the books cover different struggles children might run into as they navigate life. The books provided strong adult support which only added to the stories. The setting in England helped as well! Definitely recommend this series. Not a bad book in the least, and I liked the topic, which is probably the real reason behind all those 5-star ratings. Wasn't particularly happy with the solution, but kids will surely enjoy the story and the charming illustrations. So often, children are bothered by bullies and don't know what to do. This book by James Minter is fun to read and can help kids learn an important lesson. This book would be a great tool in school anti-bullying programs. I enjoyed this audio book by James Minter. The subject matter was appropriate for the age group intended. Bullying is something a lot of children deal with, and this book gives a child comfort in knowing that someone is listening to their troubles, and there are ways to "beat" bullying in a positive way. James is a dad to two grown-up children, and a step father to three more. His fiction writing career started some five years ago with books designed to appeal to the inner child in all of us - very English humour. Later his daughter Louise, reminded him of the bedtime stories he told her, and suggested he might like to commit them to paper for others to enjoy. He hasn't yet, but instead embarked o James is a dad to two grown-up children, and a step father to three more. His fiction writing career started some five years ago with books designed to appeal to the inner child in all of us - very English humour. Later his daughter Louise, reminded him of the bedtime stories he told her, and suggested he might like to commit them to paper for others to enjoy. He hasn't yet, but instead embarked on writing the eight-book Billy Books series for 7 to 9-year-old girls and boys. These are traditional stories, featuring negative behaviours but with positive outcomes. Although the main character Billy and his friends are fictitious, Billy's dog, Jacko, is based on his family's much-loved pet, which, with their second dog Malibu, caused havoc and mayhem to the delight of his children and consternation of himself. Before he started writing, James spent his working life as a college lecturer, and later in the computer industry. It was at a time before the invention of smartphones and tablets, when computers were powered by steam, and stood as high as a bus. The Hole Opportunity was the first product of his imagination for the inner-child. The Unexpected Consequences of Iron Overload followed a year later. A paranormal, romantic spoof thriller, written to raise awareness of a genetic medical condition called Haemochromatosis. Book II of the Hole Trilogy - A Tunnel is Only a Hole on its Side - came next. Currently, in addition to the Billy Books series of books and campaigning for children's values, James is writing book III of the Hole Trilogy - Marmite Makes a Sandwich, Dynamite Makes a Hole.